Struve's education and family background granted him all the advantages William Herschel's father had struggled to provide for the Herschel children about a half-century earlier in Hanover. Struve received a comprehensive classical education, the best his province had to offer. His father Jacob taught classical languages, dogmatics, and exegesis in Altona's Gymnasium, a university preparatory school. Indeed, Jacob Struve must have been a brilliant as well as educated man, and could have fostered his children's talents in any academic field. Though an expert in philology, the study of the historical development of languages, he filled his private notebooks with problems in statistics, probability, and number theory. Jacob even wrote a mathematics textbook that students praised for its clarity, and received an honorary doctorate for his mathematical work from the province's main university in Kiel. Struve enrolled in the most junior class of the Gymnasium at the age of six, and began the final two-year program of university preparation at 14. He never completed the program, however, as a result of his run-in with Napoleon's press gang. The incident, which Struve later recounted to his son Otto without recalling the precise date, probably occurred shortly after the famous battle of Jena in October 1806. Napoleon was then near the height of his powers, and had completely routed the Prussian forces. To rejuvenate his own forces, Napoleon had ordered the confederation of subordinate German states, such as Hamburg, to draw up fresh armies. His conscription rate in France at this time was on the order of 100 000 men a year. French troops would not have pursued Struve to Altona because it belonged to the Danish crown, which was then playing a neutral role in Europe's complex political affairs. Struve's father, however, took no chances. He wrote to his elder son Karl, who taught at a Gymnasium in the city of Dorpat, and arranged for Wilhelm to apply to the new university there as soon as it was safe to travel through war-torn Prussia. Dorpat is the old German name for Tartu in modern Estonia. In the nineteenth century, Czar Alexander I counted it as part of the Russian empire. Although Struve's family could guess that Napoleon planned to take on the Russian army, Dorpat seemed far enough off Napoleon's probable invasion route to be out of harm's way. Struve made his way there in late summer 1808 by a difficult journey lasting over a month. He carried a Danish passport, which his parents hoped would provide a cloak of political neutrality, and a letter of recommendation from his Gymnasium professors. The day after his arrival, Struve climbed up the hill overlooking the Emajogi river. All around him workmen hammered away at the university's new buildings — so many of them in the neo-classical style that later campus denizens jokingly referred to it as ''Athens on the Emajogi. 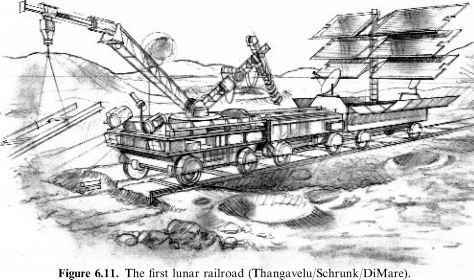 ''3 Struve undoubtedly saw them at work on the university's observatory; they had laid the cornerstone only a few weeks before. The university admitted him at once. Luckily for the 15-year-old Struve, he would not have to learn a new language to enroll. Dorpat was the only university in the Russian empire to conduct classes in German. Struve lived at first with his brother's family, but soon realized that Karl could not afford to support him as well as two small children. He began working as live-in tutor to the children of well-to-do townfolk almost immediately. At the beginning of his second semester he accepted what would become a long-term position in the household of a nobleman, Count von Berg, devoting 34 hours a week to the education of the count's four sons. This position might easily have derailed Struve's own studies. The von Bergs spent all but the coldest winter months on a family estate far from town, preventing Struve from attending many lectures, and they liked to show off their private tutor at dances and hunts. As if the life of a teacher-student were not difficult enough, Struve also had to contend with the fact that he was stuck in the wrong academic field. At the end of his first semester, he wrote home to complain that his philosophy and philology courses were too abstruse, and to plead for permission to devote himself to mathematics. Unfortunately his father, despite his own passion for mathematics, thought the humanities would serve Struve better, both from the moral perspective and in his later attempts to find work. Jacob refused to be swayed and insisted that Struve stay with his classical studies. Struve made the best of his lot. An astronomy course from J. W. A. Pfaff, the professor who had urged the construction of the university's observatory, helped sustain his interest in the natural sciences. At length his final degree examination in philology, which he passed with honors in 1810, established his independence. He declined a job offer from the Dorpat Gymnasium to teach history and quit teaching the von Berg boys, although he continued to live with them as a member of the household. With support from the university's rector, the physicist Georg Parrot, he embarked on a graduate program of his own design in physics, mathematics and astronomy. 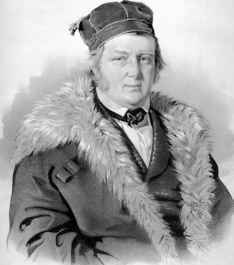 Struve's first astronomy professor, Pfaff, left the university in 1809 and his replacement suffered from poor health, leaving the observatory understaffed. As a graduate student, Struve turned this situation to his advantage. He found a transit telescope, a popular nineteenth-century instrument that could be used in the determination of longitude, still packed in the crate in which it had been delivered to the observatory. Struve would have to teach himself the art of astronomical observation, but the use of this small telescope would furnish an excellent doctoral dissertation topic. Precise longitude determinations still held great interest for mapmakers and astronomers. The special feature of a transit telescope lies with its mounting—how it is attached to its support structure—rather than its aperture or light-gathering power. A typical transit telescope (figure 5.2) rotates around a horizontal axis and can point only along a north-south line. The observer can view stars or planets only when they move east to west across his local meridian in the course of the night. In other words, it is possible to observe any object in the sky, but each object has its appointed viewing time, when it transits or crosses the meridian. The trade-off for limited range of movement is the superior accuracy and precision of pointing, which is vital for the kind of observations Struve wished to make. 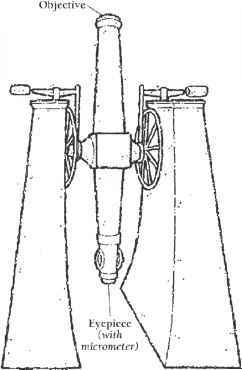 In the nineteenth century, the user of a transit telescope relied on a micrometer, a set of threads or wire reticles visible through the eyepiece, to establish precise star positions (see chapter 4, figure 4.6). A typical observation with such an instrument proceeded by the ''eye and ear'' method. First, the observer consulted a star catalog or astronomical almanac to point the telescope to the correct position along the north-south direction, ready to catch sight of the desired star as the Earth's rotation brought it into view. As the star appeared in the eyepiece and approached the wire or set of wires in the eyepiece micrometer, the observer would glance at a clock, or call to an assistant to do so, and note the time. Then the observer would pay close attention to the sound of the clock, counting the ticks while watching the star edge closer and closer to the wire. The micrometer often included several wires parallel to that marking the position of the meridian, so that an average of a set of measurements could be made. A star might require two seconds to cross a given wire. As we now know, the moment of crossing of bright stars was often recorded a little too early and the crossing of faint stars a little too late, because of characteristics of human visual perception. The observer's estimate of the exact time the star crossed the meridian therefore incorporated his subjective perception of the passage of time and of the moment of the star's crossing the wire, in addition to instrumental biases, distortions inherent in observing through the Earth's atmosphere, and other effects. After the observer had accounted for all known sources of distortion, he would compare the time at which the object crossed his local meridian to the time it crossed the meridian at an observatory in Paris, London or some other reference point. The time difference gave the observer's longitude east or west of that reference. French spy preparing the way for Napoleon's invasion. Struve was able to clear up the misunderstanding before a military judge, but the episode interrupted his work for a week. Between 1810 and 1813, Struve completed his timing observations with the transit telescope at the Dorpat observatory and combined them with timing data from other observatories in Europe. This allowed him to determine the longitude of Dorpat with unprecedented accuracy — surpassing the achievements of two former astronomy professors at Dorpat. He also determined the observatory's latitude; this is a simpler question of accurately measuring the height or altitude of a star above the horizon, as it crosses the meridian. The pole star provides a convenient indicator for observers in the northern hemisphere, because its altitude is roughly equal to an observer's latitude. An observer at 40° latitude, for example, will see Polaris reach a maximum height of 40° above the northern horizon, while an observer at the north pole, latitude +90°, will find it overhead, or 90° from the horizon. Struve used the same principle to determine the latitude of the Dorpat observatory. The faculty committee supervising Struve's combined master's and doctoral work scheduled his thesis defense for a day in late October 1813. At the last minute the exam had to be postponed, for a reason that probably brought Struve particular relief, considering his brushes with the French and Russian armies. News arrived, by mail, that Napoleon's army had suffered its first major defeat in Central Europe. Spontaneous city-wide celebrations took precedence, for a day, over university business. The university's natural science faculty members could not bring themselves to say goodbye to their industrious prodigy. After the 20-year-old Struve passed the exam they offered him a faculty position in mathematics and astronomy, with the understanding that he would direct the observatory as well. Struve's transition from student of philology to professional astronomer was finally complete.